The Bat! 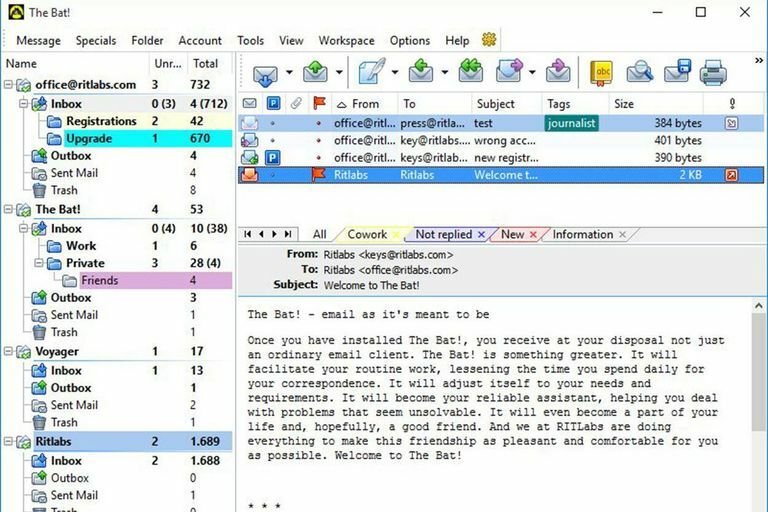 is a highly sophisticated and efficient email client. It makes handling even large volumes of mail a pleasant and secure experience. However, The Bat! does have a learning curve, and could do with a few options less. The Bat! provides powerful filters, templates and virtual folders for email management. A world-class plain text message editor makes writing emails a joy. The Bat! is a highly secure and privacy-conscious email client. Countless menu commands and options can make The Bat! overwhelming and a tad confusing. Finding emails and message relationships could be faster and easier. The Bat! manages multiple POP, IMAP, and MS Exchange accounts; for Gmail and other email services that support OAuth, The Bat! can log in securely without your password. Offers powerful filters, a versatile email search engine, regular expressions, custom color groups, free-form message tags, and folder views. Virtual folders automatically collect mail from select mailboxes based on a rich set of criteria. An "Inbox Analyzer" detects group mail and newsletters and helps set up filters. The Bat! lets you set up flexible message templates using rich text, macros, and plug-ins. A flexible antivirus and spam filtering plug-in architecture lets you enhance The Bat!. Supports S/MIME and OpenPGP message encryption as well as on-the-fly encryption of local data. Integration of RSS feeds lets you follow blog and web site updates right in The Bat!. The Bat! offers both an advanced plain text and a fully capable HTML editor. A ticker announces new mail, and The Bat! Mail Chat looks, works like chat but uses email protocols. The Bat! includes a notepad and flexible scheduling that lets you send email reminders, for example. The Bat! supports Windows XP and above. Do you like the term "power user"? Well, who does? Fortunately, that does not prevent The Bat! from making you feel very powerful with email when using it. The Bat! 's flexible filters let you do almost anything automatically in your POP, IMAP or MS Exchange email accounts. The versatile templates for canned replies (which you can use to design stationery for various occasions just as well) further ease doing repetitive tasks in The Bat! Templates, filters, and search let you use Perl-style regular expressions for exceptional versatility and precision. Custom labels, free-form tags, folder views and, best of all, particularly flexible virtual folders that automatically collect all emails matching certain, fine-grained criteria make it a snap to approach the daily deluge of email in an organized manner in The Bat!. If you let mail accumulate in your inboxes, The Bat! 's "Inbox Analyzer" helps you set up filters: it detects bulk mailers (such as newsletters), frequent correspondents (such as clients) and groups (such as mailing lists), and suggests to set up folders and filters for each. You will also appreciate the high security that The Bat! provides. Options include S/MIME and OpenPGP, remote image blocking, an interface to anti-spam and anti-virus tools as well as automatic encryption of local data. Images in emails can be enabled for trusted hosts from which they are retrieved. The message editor is powerful when it comes to plain text email, and its HTML composing abilities are apt to most needs. The Bat! can remind you about emails later. Of course, The Bat! also includes precise and powerful Bayesian spam filtering, though it could be a bit better integrated. All The Bat! 's features are readily accessible and efficient to use. Now, if IMAP support was a bit less complex, a few zany options here and there spared and the HTML support a tad more complete, The Bat! could be the absolutely perfect email client. The current version of The Bat! is 8.8, so many improvements made since this review was written are likely to be found if you try the latest version.